The Chinese visitors take a break from Treacle Market with Graham Barrow at Jack Sevens on Chestergate. 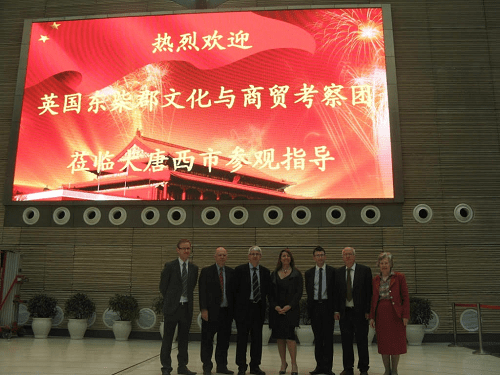 In Spring 2012, with the help of Bollington-based Tourism and Heritage consultant Graham Barrow, a delegation representing Make it Macclesfield visited Xi’an in North West China, the home of the amazing Terracotta Army and the historic Eastern end of the Silk Road. Whilst the Silk Road of ancient times was focused on the Far East and the Mediterranean the Victorian founders of Macclesfield’s Silk industry put the town firmly on the map as the furthest North and West centre of silk manufacture in Europe and provided a sound basis to claim a role as the Western end of the modern Silk Road. The 2012 delegation included Councillor Hilda Gaddum, representing not only Cheshire East Council but also the Gaddum family that, over several generations, were Macclesfield’s Silk Merchants, importing the silk that provided the raw material for the industry that built the town we live in today. These connections still resonate in modern China today and President Xi, who was born in Xi’an, has adopted the Silk Road concept to develop an important new industrial and trading strategy entitled “Belt and Road” aiming to enhance regional economic growth and trade to the benefit of all. President Xi is hosting a major Belt and Road Forum in mid-May, stimulating interest in the Silk Road in the Chinese media. 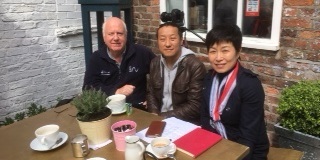 With the help and support of both Manchester Airport and the Manchester China Forum, a Chinese TV team is visiting Macclesfield to record the town’s Silk story for the National TV station CCTV. The Chinese team joined the crowds at Treacle Market last Sunday (April 30) and visited Hilda Gaddum who explained her family’s role in the Macclesfield’s silk story. Visits to the Silk Musuem, Paradise Mill and RA Smart’s modern factory in Bollington are planned as well as a visit to Prestbury Primary School as part of a programme being made specifically for Chinese children. And, with China’s ever-growing interest in football, they will also plan to pay a visit to Moss Rose, home of the Silkmen.